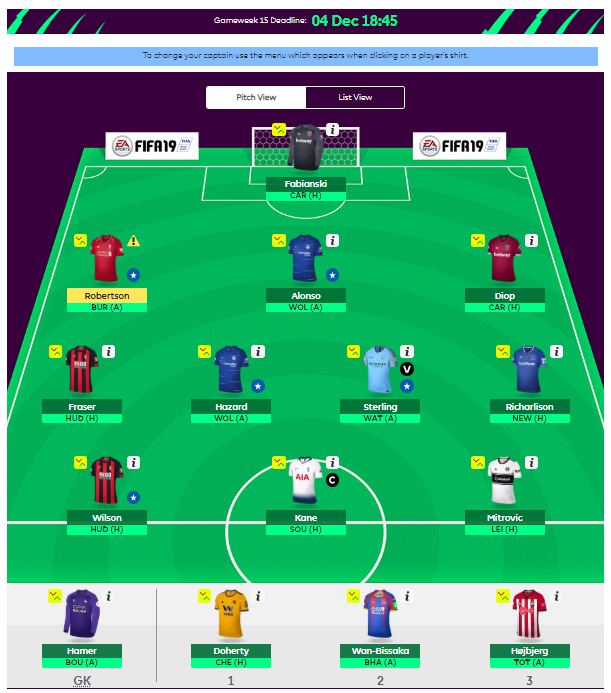 This season, we’ve pooled our (self-proclaimed) collective genius together to form ‘Team TSZ’, a fearsome squad of fantasy point machines who will gun for glory in our very own FPL mini-league. 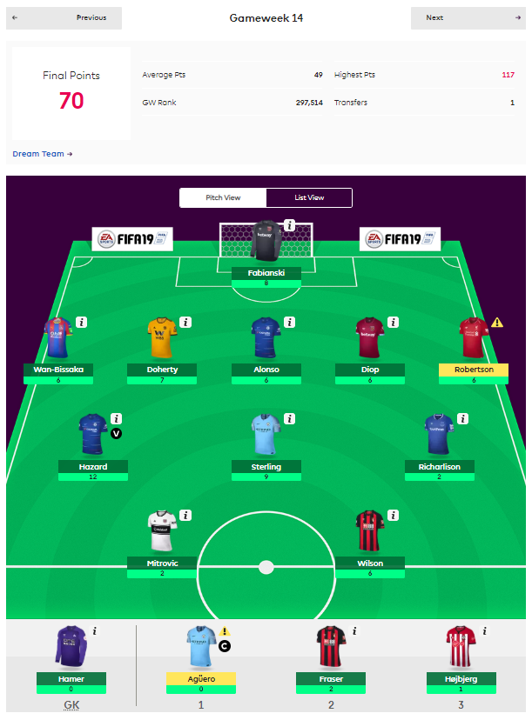 So how did we get on in Gameweek 14? "Offence sells tickets. Defence wins championships." The story of this week’s success has been our defence, with all six stoppers scoring at least six points, and a total of 39 between them. Trystan and Tim would like to make it clear, as they did to Rob in our discussion, that this is almost certainly down to the Tarkowski > Diop move they made whilst he was away on his honeymoon, and suggest the MD should take more holidays on decision days. Our first point of call for this week's discussion was the two free transfers burning a hole in our pockets. The midweek fixtures offer us the opportunity to go against the grain here, and aim to field two big-name strikers in Kane and Aubameyang once GW16 comes around. To do this, we began today by swapping out Aguero for Spurs' No.9, as Tim fatefully spoke our famous last words: "Aguero doesn't do anything away from home." Then, with a healthy 2.1 million in the bank we can replace Hazard with Felipe Anderson, and the intermittent Mitrovic for Aubameyang for the weekend. Let it never be said that here at TSZ we play it safe. Sergio, Eden, if you're reading this, be kind. We decided unanimously to keep Callum Wilson with us, as Bournemouth's fixtures look to improve after a tough run. At one point, Rob expressed his desire to bring in Anthony Martial, to a general apathy, and much head-shaking here in the office. A polite, yet firm "no" was the swift response. Despite our excellent five at the back last time out, we have reverted to our usual 3-4-3 formation. The big talking point this week was the news that FPL sweetheart Andy Robertson could well be rested with a dead leg against Burnley. Klopp might replace him with Moreno, but we couldn't bring ourselves even to sub him, so he sits ready to be replaced by Doherty. We wish you a speedy recovery, Andy, but not a ten-minute cameo at the 80th minute, please. Doherty took the first sub spot over Wan-Bissaka after much debate, as Tim suggested the Palace full-back has a poor "points-ceiling" due to his lack of goals, whereas Doherty scored on the weekend and is partial to the odd assist. Rob furthered this with a stat: Brighton have scored in their last nine Premier League games at home. If that hadn't convinced the team to demote Wan-Bissaka further down the bench, I played my role as The Stats Zone's new resident Southerner by adding that Brighton vs Crystal Palace is of course one of the odder, more vicious derbies around. In other news, Hojbjerg remains our patron Saint of Pointlessness.